The ashram sat on a small plateau among wooded hills. A narrow dirt road ran from the front gate to the back of the property, and a barbed-wire fence surrounded the property, ensuring the ashram's privacy. Along the road, away from the cliff, behind a low chain link fence were six long, whitewashed bungalows each with five or six double rooms. Flowerbeds filled with large red hibiscus blossoms garlanded the ashram and several vegetable gardens, tended by a turbaned old gardener, supplied some of the fresh vegetables we ate. Peacocks inhabited the surrounding woods and occasionally one would wander onto the ashram grounds. 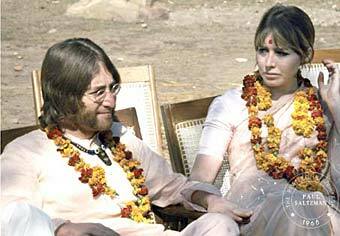 I was walking through the ashram the next morning when I saw John, Paul, George, and Ringo sitting with their partners-Cynthia Lennon, actress Jane Asher, Pattie Boyd Harrison and Maureen Starkey-as well as Donovan and Mal Evans at a long table by the edge of the cliff that overlooked the Ganges and Rishikesh. Somewhat nervously, I walked over. "May I join you?" I asked. "Sure, mate." said John, "Pull up a chair." Then Paul said, "Come and sit here." and pulled a chair over next to him. As soon as I sat down, to my surprise, I heard this voice in my head scream, "Eek! It's the Beatles!" Before I even had time to think, I was surprised by a second voice within me. This one was calm, deep and resonant: "Hey, Paul," it said, "They're just ordinary people like you. Everyone farts, and is afraid in the night." And from that moment on, I never thought of them as the Beatles again, but rather, as four individual human beings. At a pause in their conversation, John turned to me and said, "So, you're from the States, then?" "No, Canada," I answered. He playfully turned to the others, "Ah! He's from one of the Colonies, then." I said, "Yes," as we all laughed. "You're still worshipping Her Highness, then?" "Not personally," I quipped, as we all laughed again, "but we still have her on our money." "Lucky you," joked Ringo, and Paul joined in with another tease. I came back with, "Well, we may have her on our money, but she lives with you." As we continued to roll with the laughter, Cynthia good-humouredly interceded: "Leave the poor chap alone. After all, he's just arrived." "No problem," I responded, and John turned to the others with a final, "Ah! You see, mates, they still have a sense of humour in the Colonies!" and we all laughed again. After that, they just took me into their small family. Later, someone got up and said they were going to meditate. Within moments all were gone except Mal and me. I asked him if they were really as cool as they seemed. "Not always," he answered, "but pretty much." Over the following days Mal and I became buddies. He had been with the Beatles from the beginning of their success. He was a big teddy bear of a man who had been a part-time bouncer at the Cavern Club in Liverpool when the Beatles played there. He was hired in 1963 by their manager, Brian Epstein, to be one of their 'roadies'. Now, he was a personal assistant to all four of them, taking care of their needs both in England and on the road, as he was doing in Rishikesh. He called them, "the boys." I first became aware of the Beatles dancing to their early rock and roll songs, like Twist and Shout, Roll over Beethoven, and Please, Mr. Postman. By the time Can't Buy Me Love hit number one on the pop charts, in April 1964, I was a fan. Beatlemania was already exploding, worldwide, and they first toured Canada that year. On September 7 they came to Toronto. I was then twenty-one and will never forget the feeling of electricity crackling in the air as they sang twelve songs and eighteen thousand of us, packed to the rafters in Maple Leaf Gardens, yelled and screamed and set off so many flash bulbs that it seemed like fireworks popping all over the arena. It was a matinee performance, and after it was over we all made our way out of the Gardens into the late-afternoon summer sunlight, onto Carlton and Church streets. The police had blocked traffic from the area, and as the huge crowd of fans filled the deserted streets you could almost hear a pin drop. Electricity still tingled in the air. There was no jostling, yelling or calling to friends, just silence, parted by the odd hushed voice, everyone still transported by the magic of the Beatles. On August 8, 1966, the Beatles released their album Revolver in North America. I remember it vividly. Word was that the album would sell out on that first day and I rushed to buy a copy. Back at my house, my girlfriend and I smoked a joint, stretched a long yellow extension cord out the front window into the warm sun and set up my hi-fi on a large multicolored Indian bedspread on the front lawn. I put the vinyl LP disc on the turntable and we lay down, cuddled up next to each other, my arm under her head, and closed our eyes. From the first note to the last I was transported. That day, the Beatles opened a door in my psyche. I can't think of any other way to say it. It was a key moment in my life, and the song that actually did this was Tomorrow Never Knows. Lying there on the grass, eyes closed, the sun on my face, gently stoned and super focused, the lyrics sank into me. I knew the Beatles were telling me of a journey I had not yet made, of an internal place that held great love and knowing. The Beatles and their group ate at the table by the cliff, shaded by a flat thatched roof covered with vines and held up by white wooden poles. Breakfasts were cereal, toast, juice, tea and coffee. Lunch and dinners were soup, plain basmati rice and bland but nutritious vegetarian dishes with almost no spices. Occasionally, I ate with them. Crows settled in the trees nearby and silver-gray, long-tailed langur monkeys gathered on the flat roof of the nearby kitchen, both waiting for an opportunity to grab a scrap of food someone might leave behind. Perhaps this is where John wrote Everybody's Got Something To Hide Except Me and My Monkey. Occasionally, a vulture circled lazily overhead, hanging in the updraft, pausing on its way back across the river to the non-vegetarian side of the Ganges, beyond Rishikesh-itself a designated vegetarian area. George and Pattie, Ringo and Mal all had cameras with them and, as we sat around the table by the cliff, they took snap shots of the group. It felt like we were all on a family picnic. The day after I met them, I asked each of John, Paul, George and Ringo, individually, if they minded my taking the odd snap shot. Nobody minded at all. I had my inexpensive Pentax camera with 50mm and 135mm lenses and although I had never been a photographer, I liked taking pictures. People on the meditation course were off on their own, meditating ten to twelve hours a day, including Prudence Farrow. The Beatles spent their time meditating, resting, writing songs and attending the Maharishi's lectures, or having private, group sessions with him on the roof of his bungalow. My days were free to meditate, relax and hang out with the Beatles, their partners, Mal, Mia Farrow, Donovan and Mike Love, usually in small groups at the table by the cliff. The next afternoon, Donovan, Mal, John, Paul, George, Cynthia, Jane, Pattie and her sister Jennie and I were sitting around chatting about meditation, agreeing that more than one voice would play in one's thoughts and the key was to simply go back to one's mantra. John said, "Not so easy, really. I often have music playing in me head." George seemed the most serious about meditation, followed by John. Paul seemed less serious, but he'd had several profound experiences, he said, enjoying the time he dropped away from busy, worldly thoughts. Ringo was the least interested. John did say, though, that there was a friendly competition amongst the four of them to see who was really getting the best results. This article is Copyright © 2006, Paul Saltzman, and may not be reproduced on other web sites or in print, in whole or in part, without expressed permission.